San Jose becomes the City of Heroes at the end of this month when Paragon Studios hosts the second-annual Hero-Con event, with attendees scoring beta access to the Going Rogue expansion. Be sure to pack your spandex if you plan on attending Hero-Con this year, and make sure you can write legibly in order to ensure your spot in the City of Heroes Going Rogue closed beta. Paragon Studios will need you present at registration to fill out a Going Rogue non-disclosure agreement in order for you to help test out the expansion that allows heroes to become villains and vice-versa. You'll need a steady hand, however, as Paragon has to be able to match your information to your account info before they activate your access. 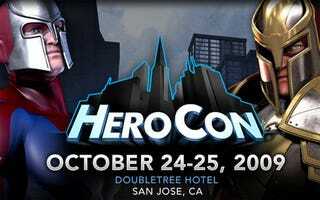 Hero-Con takes place October 24th and 25th at the Doubletree Hotel in San Jose, California. Along with the beta access there'll be panels, LARPing, community events, and in-game items to prove that you were there. You can visit the official event page for more information on how to attend this super heroic event.